Yesterday I decided to make a start on finishing the Appliqué Sampler. When I had laid out the backing, the bamboo batting (more of that later) and the top on my table I had to decide how I was going to baste it. You know I really detest curved safety pins. I’ve tried several varieties and they all damaged the fabric, so that was not an option. Then there was the possibility of using the Pinmoors. However, while Pinmoors are great for machine quilting, for hand quilting they are plain irritating. They don’t stay on the pins and as you move the quilt around the pins catch on one another and the Pinmoors drop on the floor. Just ask my husband – he has seen me sitting there quilting with a gentle rain of purple Pinmoors falling all around me! That left one alternative – basting! Hmm, it takes so long! I really didn’t want to do that. That’s when I decided to tie-baste my quilt. So I took some stitches all over it and snipped the threads and tied them loosely. I’m very pleased with the result, it’s working nicely. Take a look. Many people have asked me about bamboo batting and so I thought I’d share my experience with you. I’ve used it twice and when I’ve used up what I have left I don’t plan on using it again. It has some great properties like being anti-fungal and anti-bacterial and it drapes beautifully but I don’t like working with it. The other thing I would caution you against is wearing black when you are using it. It sticks to fabric like glue and leaves a hairy, fuzzy residue on your lovely black clothes. I forgot about this but was reminded of it as I looked down at my black shirt yesterday! At a TAS meeting last year we were told that bamboo batting is bleached with the same chemicals as are used for bleaching toilet paper! Not sure how that would affect the fabric in time to come. Thank you for sharing your experience – i will take note as i have acquired some bamboo batting instead of my usual wool. I appreciate the information on basting. I’ve been using the micro basting gun and so far it doesn’t seem to be leaving holes in my work. But I haven’t used it on more than a couple of quilt and I’m sure the type of fabric makes a difference too. I’ve never tried bamboo batting and probably won’t. Thanks for the info. I have used the bamboo batting twice as well, once for a light colored quilt, machine quilted and it was fine, but on a dark quilt, the bearding issue was huge, I am constantly picking off lumps of batting on the outside, will not use it again! 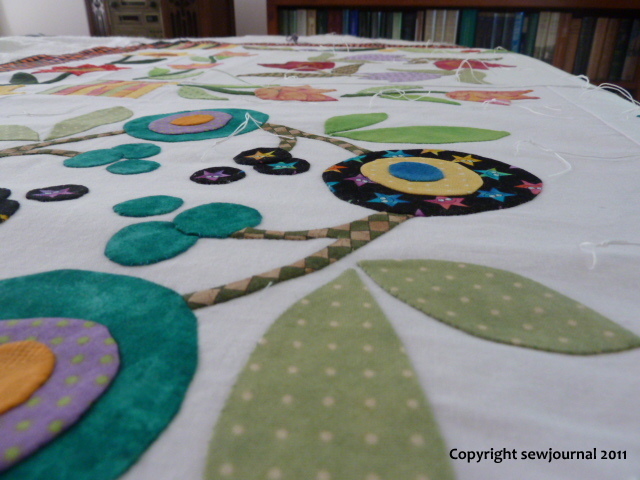 I love bamboo batting for machine quilting, but as you say, for hand quilting it’s awful! Another unique thing about bamboo, is when you use it for a table runner it doesn’t hold a fold. I can have a table runner with this inside it put away for months, get it out, open it up and lay it out and within the hour the fold is gone. If you are machine quilting Julie it won’t be a problem.